No I’ve not gone completely mental and started reviewing boats as well as pubs it just so happens that this pub is named after the famous tea clipper which is on display just up the river. Cutty Sark is in Greenwich; famous worldwide as this is where time was invented. Yes, back in the mists of ages lost in the murky past the English harnessed the power to manipulate the strands of time and the fabric of reality itself and it is this which allowed them to forge their massive empire whilst supping tea and laughing their heads off (the previous statement may not be entirely true). This being a hub of touristy things Greenwich is pretty ruddy busy and the Cutty Sark pub is just far enough away from the thick of it to feel relaxed. 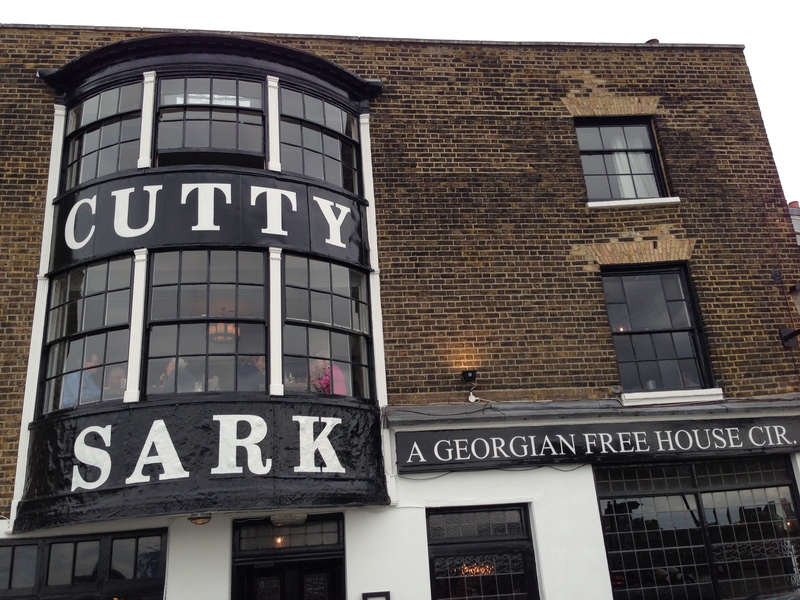 The simplest way to describe Cutty Sark is by telling you that it’s eye wateringly expensive and more than a wee bit posh. 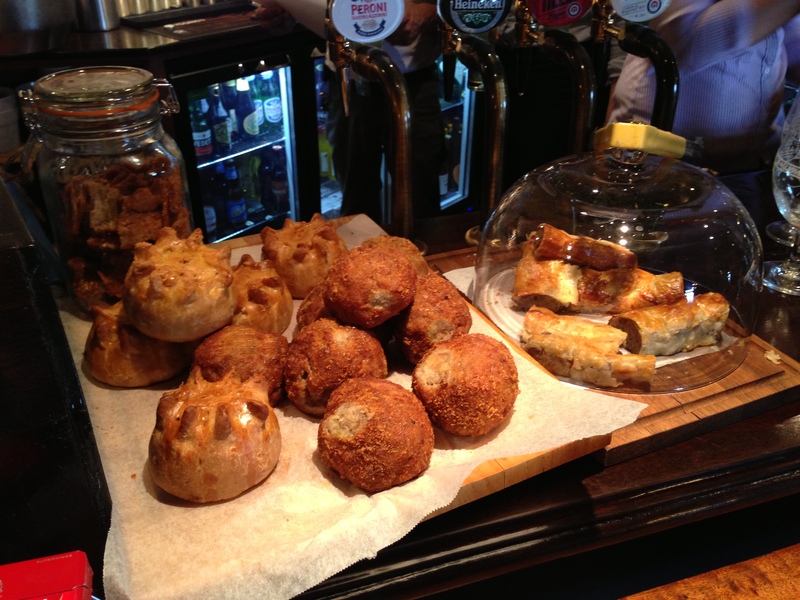 There is no way to escape the fact that you’re not going to see any significant change out of a fiver when you buy a pint and the utterly irresistible and incredibly tasty (speaking from experience) array of pork snacks on the bar cost a minimum of £3.50. You may need to eBay a loved ones organs in order to enjoy a full meal here but if the pork pies are anything to go by it’d be a wise investment; everyone has a least favourite child anyway and little Jimmy can get by with one kidney. If you see past the prices or just don’t care, because you’re a rich git, then this is a damn fine pub. My companions and I were fortunate enough to go on a fine day (more than 10 degrees centigrade and not raining) and so sat on benches just across from the entrance but it’s pretty stunning inside and very tasteful even if it’s not a classic British pub theme. It’s very family friendly if you’re into that kind of thing (see The Griffin for my thoughts on children) and was unusually very positive about dogs with a jar of dog treats inside the entrance(fairly confident these could double as child snacks for more open minded parents who don’t want to buy little Jimmy his own sausage roll). There is a strong offering of ales and a distinct effort to serve lagers that are a little more interesting that the standard I’ve come to expect. Final verdict? It’s alright. The view isn’t quite as great as others along the river and the prices are a shade too high. However if you are in Greenwich and don’t fancy rubbing elbows with someone who just bought an ‘I Love Seafaring’ t-shirt or a ‘Keep Calm it’s Greenwich Meantime’ mug it provides a handy escape that slack jawed pavement cloggers almost certainly won’t find.